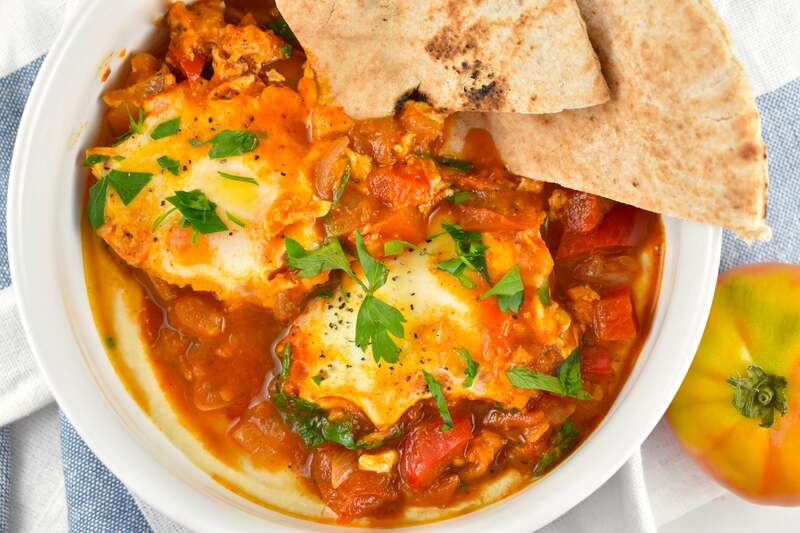 It’s a silly sounding word, but the deliciousness of shakshuka is no joke. 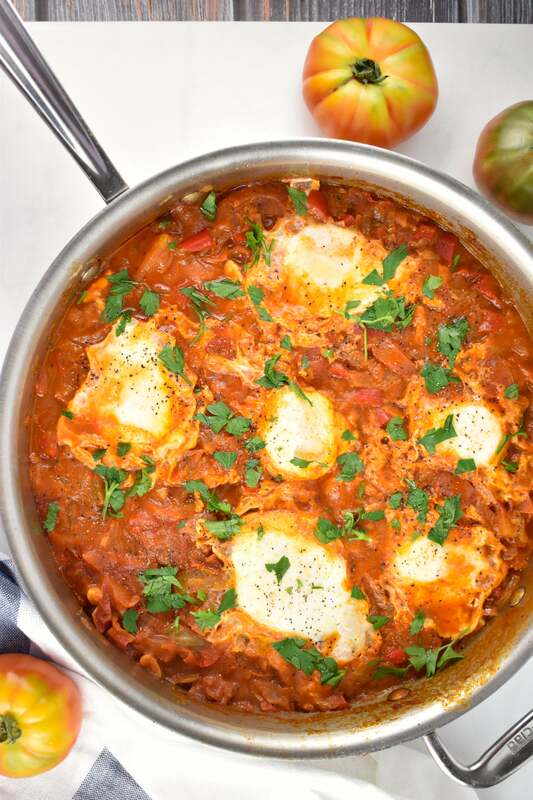 An onomatopoeic Hebrew and North African word, literally meaning “all mixed up”, shakshuka is a spicy eggs and tomato dish that is popular throughout the Middle East, particularly in Israel. 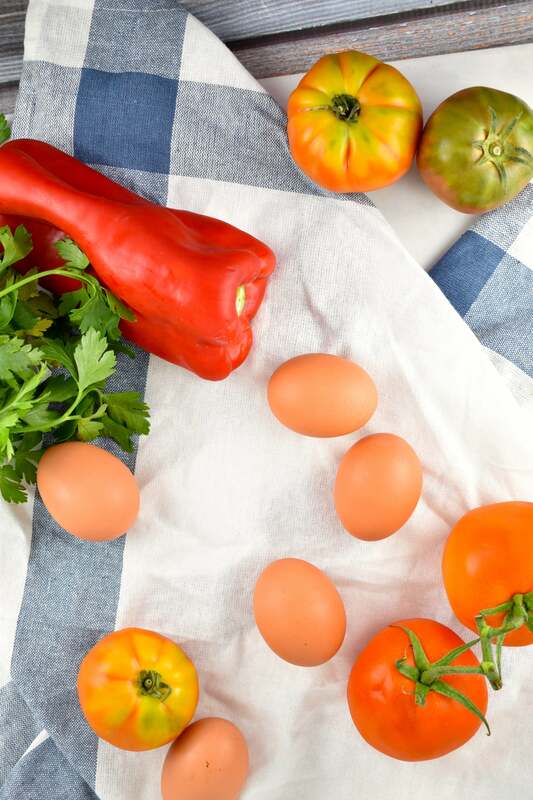 Eggs have always been a main protein for the people in Israel, and shakshuka is pretty much synonymous with breakfast there. The most famous version of this delicious dish is served at the Doktor Shakshuka Restaurant in old Jaffa, Israel. Shakshuka tastes INCREDIBLE!!! So many flavors, textures, and colors! 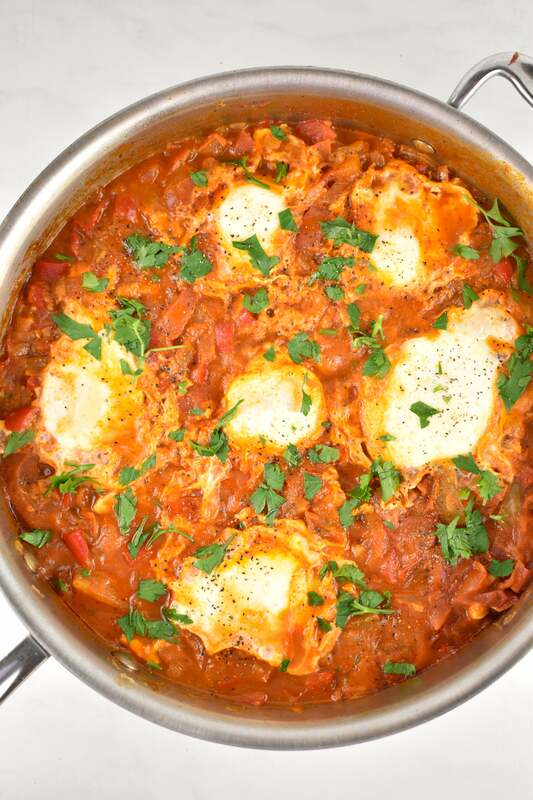 My favorite way to eat the Israeli Shakshuka is spiced up with some Frank’s Red Hot Sauce (best hot sauce EVER!!! ), which adds a nice hot and tangy taste. YUM!!! The best part is, you can really pig out on this stuff with absolutely no guilt. So it’s a great way to really satisfy your hunger, pack in some amazing nutrients and vitamins, and stay within your Weight Watcher Points!!! My fiancé taught me to Shakshuka in a bowl over fresh Israeli hummus and wipe it with a warm pita bread. Trust me! He knows what he’s doing…it is BEYOND good! I highly recommend to spend a coupe of extra Points, and serve it atop fresh hummus. 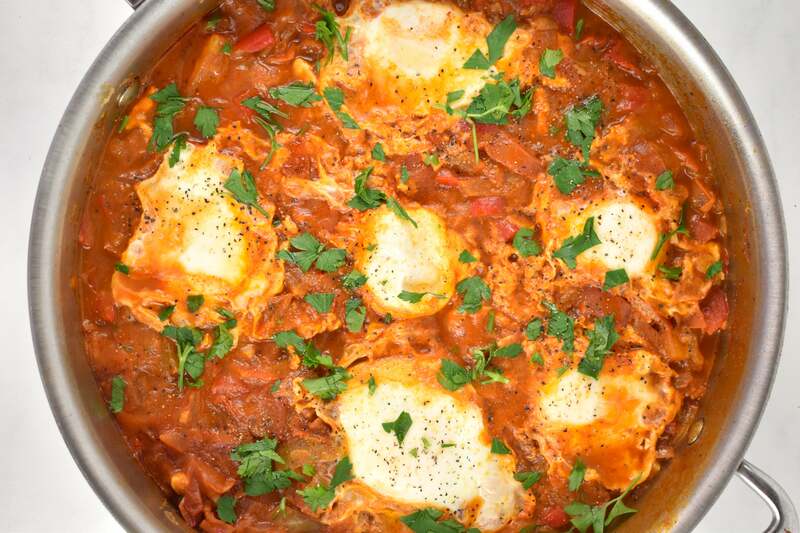 A spicy tomato and eggs dish, popular in the Middle East and typically eaten for breakfast. It’s an easy vegetarian one-skillet meal, that is deliciously addicting. Heat the olive oil in a large frying pan over medium high heat, and then add the onion and garlic. Sauté until tender, about 2-3 minutes. Add in the bell peppers and continue cooking for about 3 more minutes, stirring occasionally. Turn heat down to medium. Add the tomatoes, broth, jalapeños, tomato paste, paprikas, and cumin. Stir well. Cover the pan, and simmer the mixture for 15 minutes. Turn the heat down to low. Season with salt, pepper. Allow to simmer, uncovered, for another 5-7 minutes, allowing the liquid to reduce. Gently crack the eggs, one at a time, over the tomato mixture, spacing them evenly on top of the sauce.The eggs will cook over easy style on top of the sauce. Cover the pan and continue cooking the mixture for another 5 minutes, or until eggs are desired texture (runny, soft, or firm). I am addicted to this!!!! I spread Trader Joe’s Eggplant hummus on a warmed corn tortilla and spoon the eggs and tomato over it. (My take on traditional hummus spread on pita) Sooo good! That buttery perfectly cooked egg yolk with the fresh tang of tomato, you are so missing out. this is not an Israeli dish.. this is a Palestinian dish..
Actually, Shakshuka is made in some form all around the Mediterranean. The Basque piperade, for example, begins with a similar saucy tomato mixture, but instead of poaching the eggs on top, they’re scrambled into the simmering sauce. The Turkish version includes the same ingredients baked into a thick omelet. My recipe is based on versions I've tried in Israel. How many servings in the recipe as prepared? And Israel and Arabic countries have shared lots of food together, so these recipes are very similar. Other than that .. i like ur recipe .. its quiet interesting twist on the original .. will let u know when i get to try it … Laila .. Yes, I agree that recipes are very similar in that region. 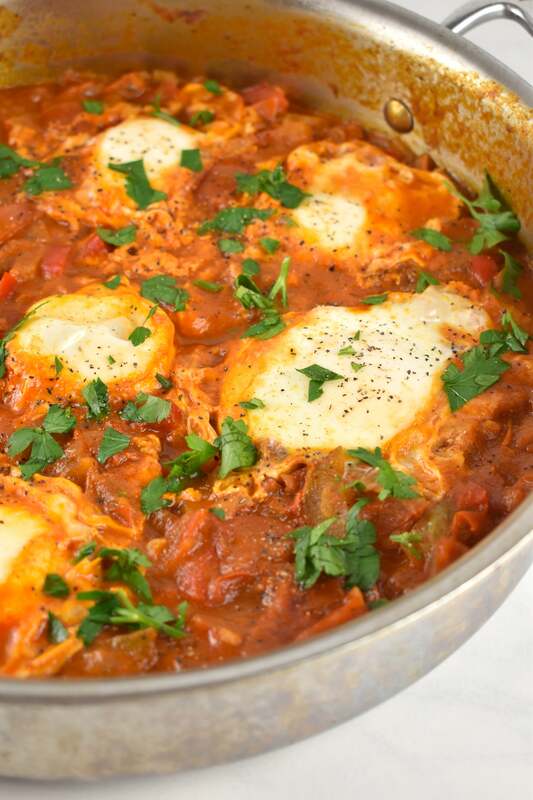 Let me know how my shakshuka recipe came out for you! 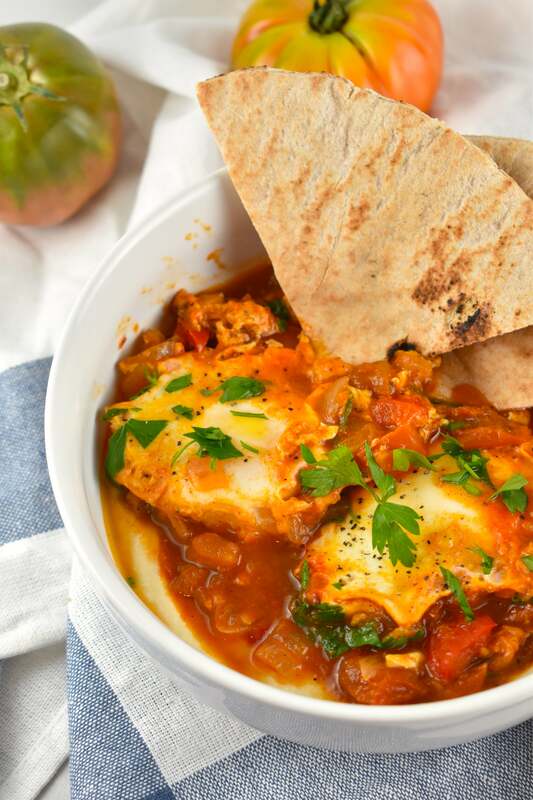 The shakshuka is of Middle Eastern origin and is a traditional Sephardic recipe. The Sephardic Jews came from North Africa. It was brought to Israel by Sephardic Jews but it’s an Arabic dish. Shakshooka is Arabic. Its technically an Arab, not Israeli, recipe.